Evelina Gevorgyan is laying cards to read her fortune, although it is a pastime she no longer believes in. “My future was foretold long before, I was to be a great singer. But Article 58 was stuck on my back. Who would allow me to follow a singing career?” she says. Article 58 of the Criminal Code of the Russian Soviet Federative Social Republic made anti-Soviet propaganda an offence, for which she was convicted and sentenced to four years in prison in 1942. It was article 67 in the equivalent code of Soviet Armenia. Evelina, now 86, lives in a company watchman’s room measuring only 3.5 square meters. 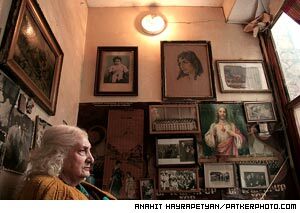 Her work and life are contained in this one room, even smaller than her KGB cell. But that’s fine, unlike many she does not remember the Soviet Union fondly. Her father Yervand Gevorgov, a merchant and agronomist, was a member of Yerevan’s elite – his stores were located in the present Kirov park, and his house stood on the site of today’s Poplavok jazz restaurant, a favorite hangout of Yerevan’s new elite and middle class residents. It was written in the verdict passed on Evelina — “social status – from former dispossessed kulaks”. From the early years of Soviet rule until the late 1930s those who had owned property were considered kulaks. Their property was confiscated and they were exiled. Evelina’s social origin was already considered to be a criminal offence. On March 8, 1942, on international women’s day, Evelina, a 22-year-old student at music college, was arrested in one of Stalin’s regular purges. She met the people with whom she was accused of plotting anti-Soviet propaganda for the first time only when she was brought to court. She was sentenced to hard labor felling trees in the Urals region, but World War Two, so misfortunate for so many, proved Evelina’s salvation. Instead, they were taken to Baku and then to Krasnovodsk by steamship: “We disembarked in a cemetery and each of us chose a tombstone to sleep on. Then a convoy came at night and they made us line up in five rows,” she recalls. “They were to take us to the distribution point and they warned us that anyone who could not walk would be gunned down on the spot. There was an Armenian girl there, Asya, who could barely walk from pneumonia. Two Armenian thieves, Pavlik and Mukuch, said they would carry my things so that I could prevent an Armenian girl being killed. I helped her to walk, stopped her from falling to the ground. They were taken on to Tashkent by train, 120 prisoners in each carriage. An epidemic of cholera was decimating their numbers. Evelina says: “People were dying all the time. Suddenly, the train would stop in the middle of a desert to throw out the dead. They left the bodies lying there, there was no time to bury them. “A German woman next to me died from cholera, she stayed beside me, dead, for half a day until they came to throw her out. I wonder how I didn’t contract the disease. In the afternoon they gave us fish to eat and we were terribly thirsty. At night they gave us water with worms in it. Of about 5,000 prisoners on the train, only 1,700 made it to Tashkent. They were placed in the same barracks in the penal colony, working next to political prisoners and criminals. They worked on looms making cloth, but one day Evelina contracted jaundice. “Suddenly I had an acute pain, I fell and they carried me out on a stretcher. I was losing consciousness, I was in a very grave condition,” she says. “There was a doctor, Abazov, he had been the people’s commissar (minister) for healthcare in Turkmenistan. He had been in jail for 16 years and it was not known when he would be released. For prisoners like him there was an order from Beria – unless a special instruction was issued, you were imprisoned for life. “Abazov said ‘you are a political prisoner, I won’t let you die’. Seven or eight people in the infirmary, who were also suffering from jaundice with me, died. But he didn’t let me die. They placed us in the same barracks as people convicted of criminal offences so that they would abuse us, but some of them treated us well. It was not as terrible in the camp as after being released from it. 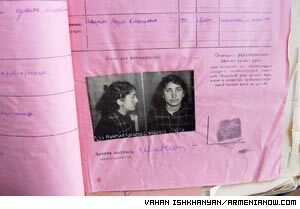 Political prisoners like Evelina did not have the right to live in 39 cities, including Yerevan. For some time she lived at her mother’s home in Dilijan, then a relative appealed to a senior government official to let her return to the city. “I was one of the few former political prisoners allowed to stay in Yerevan,” she says. Evelina continued her education, but as a fourth year student she was expelled as a decadent, under Article 58 again. With the help of an uncle, she got reinstated at college and completed her studies, but she did not enter the conservatory later. In 1951 when thousands of Armenian families were being expelled to the Altai area, Evelina had her trunk packed and was waiting for the authorities to come for her. But exile passed her by. She married a persecuted man like herself and gave birth to a son in 1955. 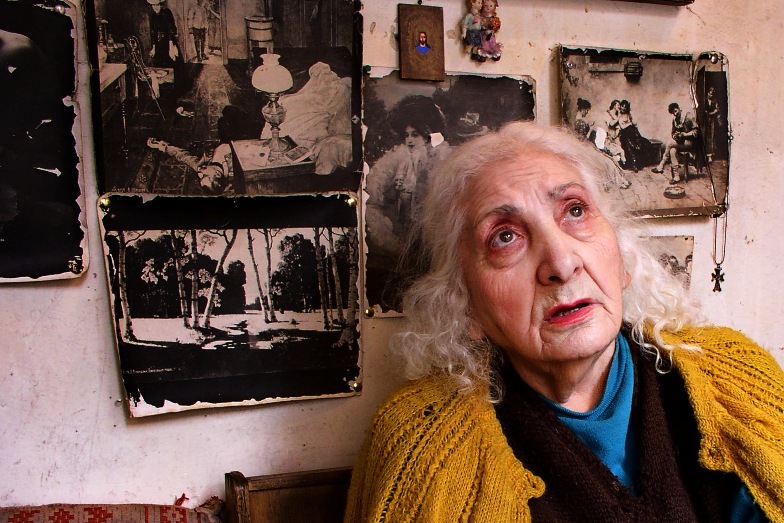 In 1957, Evelina Gevorgyan and five people convicted together with her were acquitted. She sang for ten years in the state choir, also in the Opera chorus and from 1975 she worked as a comptroller in the hall of a chorus company. 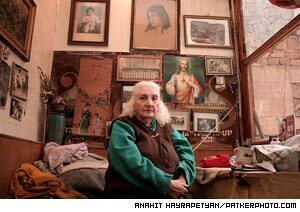 She sold her home in 1984 to give her son an opportunity to leave Armenia. For years she lived in a rented apartment, but when the years of economic crisis struck she could no longer afford to stay there. In 1993, she was given the small watchman’s room at the Chorus Company, where she lives and works as the watchman of the building. All she possesses now are her photographs and some kitchen utensils. The room is so small that it is impossible to lie down flat, and when Evelina wants to get some rest she places a chair under her feet and lies on a narrow ottoman. Under the law for victims of repression, those who need housing are eligible for a plot of land and a preferential loan for 25 years of up to 5 million drams (about $11,000) to buy an apartment or build a house. However, changes in the legislation mean no land has been allotted in Yerevan since 2003 and none has been available outside the city either since December last year. Victims of Soviet oppression are also entitled to lump-sum compensation of 12,000 drams (about $26) from the State. In 1996 it was 6,000 drams. There are 570 loan applications from repressed people at the Ministry of Labor and Social Affairs, of which 311 are considered well founded. Evelina is 233rd on the list. Since 2002, loans have been issued to 165 people, including only 42 last year. The government allocates 100 million drams annually for this program and Evelina can expect to get her loan only in 2010 when she will be 90. “Are they mocking me? What shall I be in four years?” she says.